BERLIN – Fifty young people from the Western Balkans met young people from Germany, France and the European Union, as well as from the EU accession candidates and the EU’s Southern and Eastern neighbors and discussed topics like war and peace together as part of an international, intercultural meeting that was held in Berlin from 14 to 18 November 2018. The “Youth for Peace – 100 Years After World War I, 100 Ideas For Peace” was the program’s final event after the fifty youngsters had a preparation meeting in Belgrade on 12 to 14 October where they discussed the history and remembrance of the World War I among themselves but also with a number of lecturers from the region and Europe. The 500 young participants worked in 20 groups of 25 participants for 3 days of workshops. The results of their work, namely the “100 Ideas for Peace”, were presented to German Federal President Mr Frank-Walter Steinmeier and French President Mr Emmanuel Macron at the closing ceremony on 18 November. Among a number of decision makers, RYCO Secretary General Mr Đuro Blanuša represented our organization. As part of a dialogue with representatives from the fields of science, media, politics and culture, the participants had the opportunity to discuss or creatively implement different topics in workshops. On-site activities in peace education, as well as an exciting supplemental program that includes alternative city tours, a film and football night and visiting places of remembrance and memorials in Berlin were organized. This youth meeting gave the participants the chance to meet new people and learn what their peers think of the topic of war and peace in and around Europe and in the world. The remembrance of the millions who died during the First World War (1914-1918) and its repercussions takes very different shapes in each of the societies and countries involved. 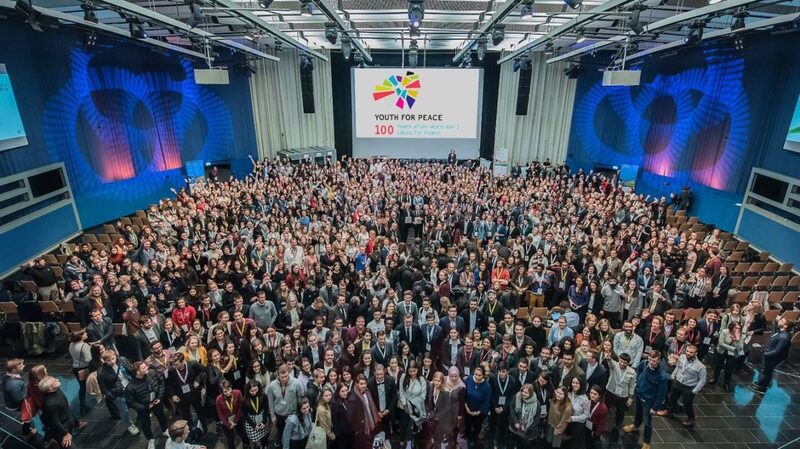 The international youth meeting “Youth for Peace – 100 Years after World War I, 100 Ideas for Peace” stands under the patronage of the German Federal Foreign Office and the Mission du Centenaire de la Première Guerre mondiale (MdC). The event is realized by the Franco-German Youth Office (FGYO) in close cooperation with the Institut français d’Allemagne / French Embassy in Berlin, the Volksbund Deutsche Kriegsgräberfürsorge e.V. (VDK) and the Office National des Anciens Combattants et Victimes de Guerre (ONACVG). Additional partners of the event were: Deutsch-Polnisches Jugendwerk (DPJW-PNWM), Koordinierungszentrum Deutsch-Tschechischer Jugendaustausch (Tandem), Fachstelle für internationale Jugendarbeit der Bundesrepublik Deutschland (IJAB), Jugend für Europa, Regional Youth Cooperation Office (RYCO), Stiftung Deutsch-Russischer Jugendaustausch (DRJA), Koordinierungszentrum Deutsch-Israelischer Jugendaustausch (ConAct), UK German Connection, Deutsch-Türkische Jugendbrücke, Deutsch-Baltisches Jugendwerk (DBJW), Körber-Stiftung et al.